runjoey: 10th Derby 50k finish and counting ? 10 years in a row is a long time to do anything with so many things that can come up to break the streak. The only race that I have done more times than Derby is the Virginia 10 miler in Lynchburg. I had a 15 year streak for that race from 1978 thru 1992 but with the early 90's came the dark years and very little running and the streak was broken. Hope nothing like that ever happens again and if I ever do break the Derby streak it will be because of something good coming up. Otherwise I plan to return as many years as possible to this great little event that Mark Long has directed for our running pleasure all these years. 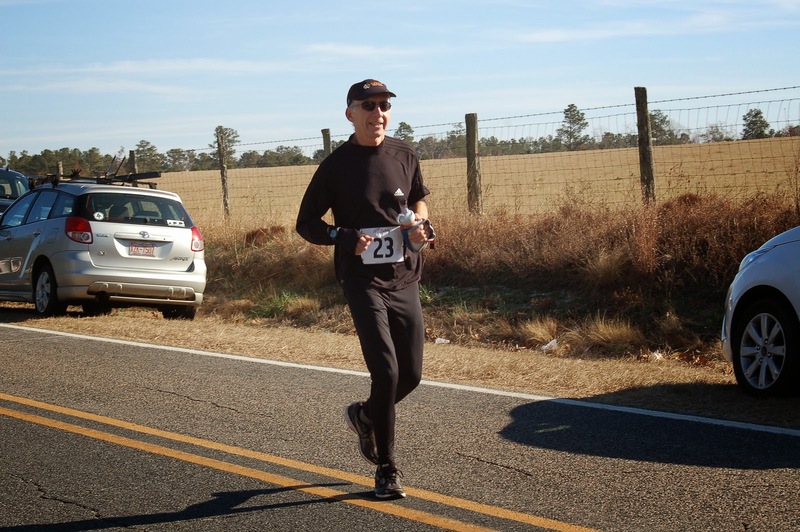 I was very excited this year to be returning to run and claim my 10 year special finishers chair despite being a bit disappointed knowing that due to recent injuries I was not in shape to race it hard. I met up with my dear friend Jenn the Ultra Angel at 5:15 to share the 2 hr ride to the Derby Community building. As always it's great to meet so many familiar faces, some of which have been here from the beginning as participants or volunteers. Of note is the only one going for finish 11, Tony Rouse. I met Tony way back then and we have shared many miles in races over the years. And Bill Keane who was also going for #10. My first memory of actually talking to Bill was in the middle miles of the Beech Mountain Madness 50k in 03. Always a pleasure to hear the stories from his decades in the sport. More often than not its a bit chilly at least for the start and this year it was in the upper 20's so I was dressed a bit more warmly than I would have been if I was going for the pr. My plan was just to start off easy until aid station 1 near the 4 mile mark and then assess the situation. I stuck with that plan and ran the first couple of miles with Fred Dummar. The pace was easy but it wasn't feeling that easy so I already knew there was not going to be anything close to a fast time. Even though I know a pr was a fantasy I was hoping to at least run around 5 hours. As I came into the aid station I didn't need anything yet so I just spoke to Susan and the Professor who have been bravely standing in the cold wind here for many years, then ran on. Things weren't feeling any better by the time I made it over to AS 2 which was staffed by my friends the Akers and Angels Amy and Jenn. Gotta love races where you are friends with just about all the volunteers ! I told them as I passed through that there would be no miracles today and moved along. Strangely enough at mile 8 I suddenly began to feel pretty good and the pace seemed quite comfortable. I actually ran strong up the mile long hill and then ran strong back to the start/finish. I grabbed a delicious cookie that Liz Crepo and daughter had cooked for us and went back out on loop two feeling confident that I just may have a shot at that 5 hour time after all. I had planned on ditching the vest but it was not getting much warmer and the wind along Pappy Rabb and Derby Road was bone chilling so I stayed wrapped up. I did run strong for the next few miles but after one more trip up the hills and then into the wind again I knew that if I tried to push it then I would probably blow up and memories of my wretched run at OBX just three weeks before were fresh in my mind so at mile 13 I backed off again. The remainder of the lap was uneventful. Everyone was spread out over the course so I didn't really have anyone to talk to but just tried to enjoy the day and put the miles behind me. My time for the 2nd loop was only a few minutes slower than the first and after 21 miles I was still running ok if just a bit slow. Another yummy cookie and it was off for the last lap and claim my chair. And although I was slow I still was running nearly all of the last lap with just a couple of short walk breaks on the hills and through the aid stations. When I got back around to the mile long hill with 2.5 to go I was beginning to feel tired and it was my slowest mile of the race but once I got back onto Derby Road for the last 1.5 I had a resurgence of energy and ran strong the rest of the way at a pace a bit faster than any other mile since mile 22 so I was very encouraged by that as I prepare to rest up and begin training for new challenges in 2014. Big smiles as I was greeted by Mark and other fiends at the finish. Before I could claim my chair though I had one more thing to do. Yep, it's become a tradition of it's own now. 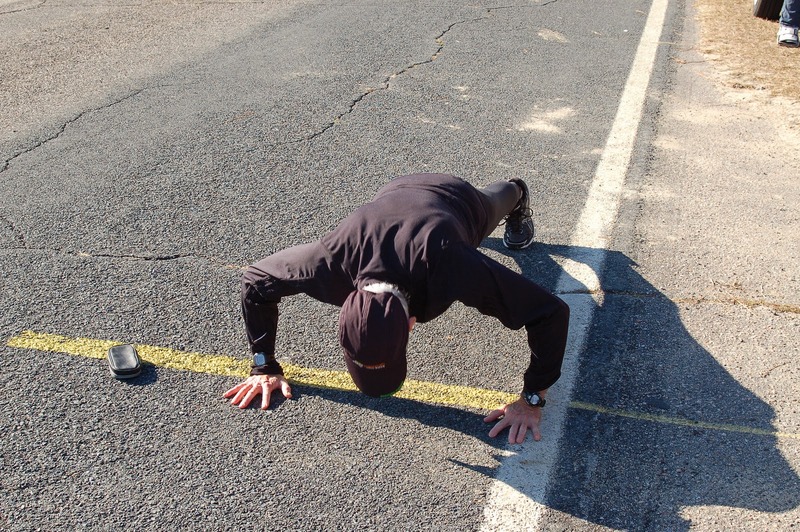 I dropped down at the finish line in the road and did 41 pushups, one for each mile and one for each finish. Guess I'll have to do 42 next year. Got my chair and then went inside to enjoy another delicious spaghetti dinner from the church ladies and hang out with old and new friends sharing our stories of the day. That is one of the things that makes this event so special. Big Thanks to Mark and all the volunteers over the years that give us the opportunity to enjoy a little run every year on Thanksgiving weekend. Hope to see you next year !